ISLAMABAD: The groundbreaking ceremony of Aviation City and Air University Aerospace and Aviation Campus was held at the Pakistan Aeronautical Complex (PAC) Kamra on Thursday. Ahsan Iqbal, Federal Minister for Planning, Development and Reforms was the chief guest of the ceremony. Air Chief Marshal, Sohail Aman, Chief of the Air Staff, Pakistan Air Force was also present at the occasion. 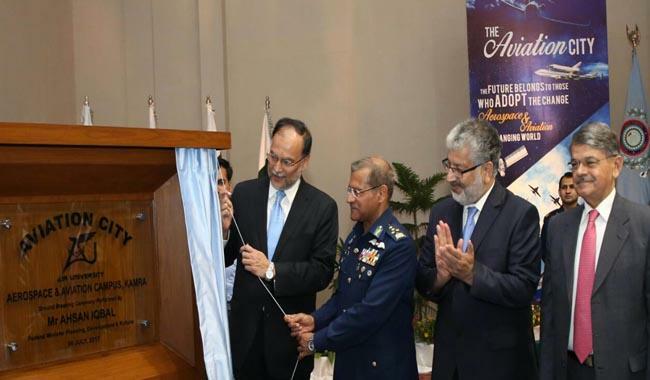 Mr Ahsan Iqbal and Air Chief Marshal, Sohail Aman, unveiled the plaque for groundbreaking ceremony of Aviation City and Air University Aerospace & Aviation Campus. Former Air Chiefs, Dr Mukthar Ahmed, Chairman HEC, Air Vice Marshal (Retd) Faaiz Amir, Vice Chancellor Air University and high ranking civil and military officials also attended the ceremony. Aviation City would house various hi-tech and state of the art academic, research and development institutes which would pave way for achieving everlasting self reliance in the field of aviation industry. At the heart of Aviation City lies the Air University Aerospace and Aviation Campus which has been modeled after the internationally acclaimed Aviation Universities in the world and it would focus hands-on learning in state-of-the-art maintenance & avionics repair facilities, and first class simulation centers. An Aviation Research, Indigenization & Development (AvRID) would also be the part of aviation city which would primarily focus multi-disciplinary R&D in specific technologies. Another important institute the Aviation Design Institute (AvDI), being part of this mega project, would utilize the growing R&D potential of PAF and focus capability enhancement of the existing PAF fleet. This institute would also undertake the phase-wise designing, production and evaluation of fifth generation aircraft indigenously. Its airworthiness certification agency would provide credibility to its products and development of this next generation fighter aircraft would be a testimony to this collaboration. While addressing at the occasion, the Air Chief said that this event is an unprecedented milestone in the history of PAF as well as Aviation Sector in Pakistan. He said that the realization of this campus is in fact part of the strategic vision of Pakistan Air Force to develop industry academia linkage in the form of aviation city. He further added that this is a path to self reliance and it is a dream to let Pakistan aviation industry grow and support country’s economy. The Air Chief also gave his vision of designing a 5th generation fighter aircraft, medium altitude long endurance UAVs and development of advanced weapons as golden opportunities for the engineers to venture into these domains. He further said that we have stepped onto a path which will ensure indigenization of civil/ military aircraft, weapons and avionics which is the need of the hour. Addressing the gathering, Ahsan Iqbal said that Pakistan Air Force has rendered countless sacrifices for the elimination of terrorism from the country. He further said that it is imperative to strengthen the Pakistan Air Force for a stronger Pakistan. He appreciated the earnest efforts of Air Chief in establishing a state of the art Aviation City at Kamra and hoped that this mega project would provide quality education with high-tech facilities. He, on behalf of the Government also pledged to provide every possible resource for transforming this dream into reality.